Found 79 file extension associations related to Safari and 24 file formats developed specifically for use with Safari. 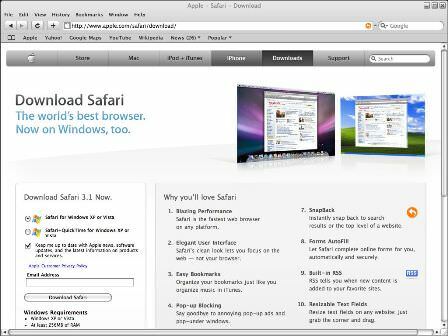 Safari is the default web browser integrated to Apple Mac OS X since version 10.3 "Panther". It is also used in iOS devices like iPads and IPhones. With a simple, elegant interface, the Safari browser gets out of your way and lets you enjoy the Web. Features include: fast performance; an elegant user interface, easy bookmarks, pop-up Blocking, inline find, tabbed browsing, SnapBack, automatic form filling, built-in RSS, resizable text fields, private browsing, and security. Cross-browser testing tools - Some of the best browser testing apps and sites you can find on Internet. How can I open a .webarchive file on Windows? - Opening Safari documents. Useful Safari extensions - Safari social, security, utility and developer extensions. How much time do you spend on Facebook? - How to check your time that you spend on Facebook with Facebook Runner. If you need more information please contact the developers of Safari (Apple, Inc.), or check out their product website.